• The school ethos promotes active listening with children and staff. • There should be a reference to Talk for Learning within the Teaching and Learning policy. • The school improvement plan clearly shows Talk for Learning as a school improvement tool. • The budget shows that time and money has been spent on introducing Talk for Learning in the school. • All teaching staff and the leadership team, know and understand Talk for Learning methods. • All new staff have an induction to Talk for Learning methods. • Children are all trained in paired talk using echo, pause and rewind, knee to knee and shoulder to shoulder positions. • All teachers are introducing Talk for Learning structures in their classroom. • Planning shows some Talk for Learning activities are in place in lessons across a range of curriculum areas. • There is improvement in the pupil’s engagement and Talk for Learning skills of children from baseline measures. • Governors know and understand Talk for Learning as a methodology for improving the quality of teaching. • The school ethos promotes Talk for Learning strategies in staff meeting for the teaching and support staff. • The teaching and learning policy should be based on Talk for Learning methodology. 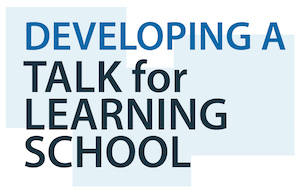 • The school improvement plan clearly shows Talk for Learning as a key school improvement tool. • The budget shows that time and money has been spent on developing Talk for Learning in the school. • Talk for learning is evident in every core subject lesson plan. • Support staff are actively involved in Talk for Learning in the classroom. • There is continued improvement of pupil engagement and talk for learning skills from previous measure. • Hard to reach and pupil premium children are more engaged in whole class teaching. • Children’s books reflect the Talk for Learning activities that are in most lessons. • Governors are able to see Talk for Learning when monitoring school improvement. • Pupil progress in core subjects is improved for most pupils. • The school ethos promotes Talk for Learning strategies at all meetings. • The curriculum and other policies should reflect Talk for Learning methodology. • The school improvement plan clearly shows the Talk for Learning as the main school improvement tool. • The budget shows that time and money has been spent on continuing Talk for Learning in the school for the long term. • All teaching staff have had training in planning talk for learning journeys. 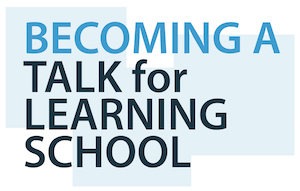 • Curriculum planning shows talk for learning journeys across all areas of the curriculum. 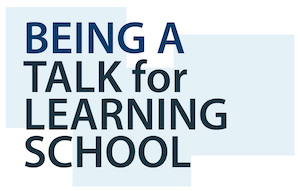 • Talk for learning is evident in learning walks, observations, planning, pupil interviews and looking at outcomes through books and pupil progress meetings. • Children create opportunities for Talk for Learning in class and beyond. • Support staff use Talk for Learning methods when working independently with groups. • There is consistently high quality of Talk for Learning in all classrooms and lessons. • Subject leader’s in-house training and monitoring should reflect the Talk for Learning methodology. • Behaviour for learning improves and incidents of poor behaviour are reduced. • Hard to reach children have more positive attitudes to school, improved attendance, are more punctual and have more involvement in out of school hours activities. • Pupil progress is improved for the vast majority of pupils.